There were a few varieties of cakes displayed in the chiller at the Yen Ai eatery shop last night. We chose to try the chocolate cake and the carrot cake because we were told that these are the ones just arrived today. 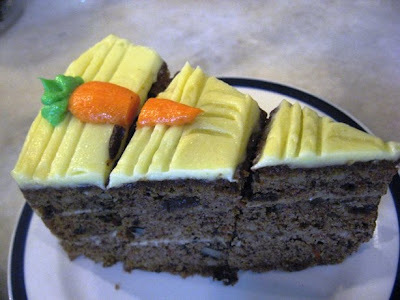 Each piece of the cake cost RM6.00, very expensive, more expensive than a chicken rice or a plate of fried mee. a very disappointing piece of carrot cake, dry and hard, not up to our expectation. I am already looking forward to Christmas though there are still over two months to Christmas Day. 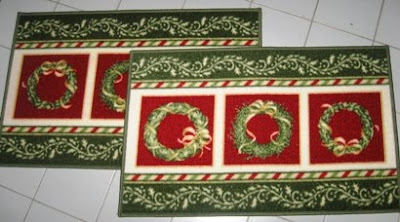 Leading to celebration I bought two of the same door carpets featuring Christmas wreaths to replace the front door carpet and the other one for my father. This Christmas I was thinking of baking the easiest fruit cake that I learned last year from my cousin. It is called the Boiled Fruit Cake. 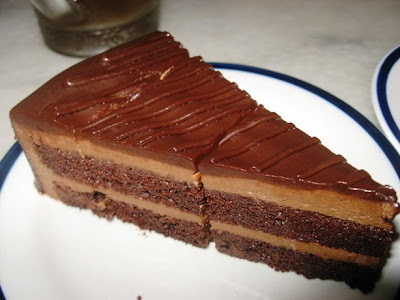 You could try this recipe too I am sure you will love it. I woke up earlier than usual this morning, that's at 5.30 am, to do some house chaos. I have been so much slacking on the house work ever since I started baking. There are piles of unfolded laundry and floor needed to be swept and mopped among other things. This morning, I only managed to sweep and mop the floor, do some ironing and laundry, fold and put away the laundry. The sunrise very fast. It's time to wake the girls up for school. I kept yawning in the office for not used to wake up so early. Should I continue rising at 5am again tomorrow? Today is my younger brother, Alfred's birthday. I baked a cake for him this morning. With the encouragement from Clet and the recipe from SIL, I finally managed to bake a cake for my family single handedly. For sure there will be more cakes to come in the coming days. A simple cake to wish Alfred a very happy birthday. Do you know what is the best way to enjoy eating durians? The kampung/village style, everyone gather around on the floor and open the durians one by one, it's fun to experience the different texture form each of the durians, I like the thick creamy with slight bitterly taste durian, and the smallest seed possible. From an outstation trip to Sipitang yesterday, my brother bought several bundles of durians on his way home, each bundle consist of 3 - 4 durians, besides 2 of them have been conquered by the insects, we still have got more than enough to share. We ate until we could not take in any more durians into our stomach. My sister took some home and I frozen some for making cakes. So far I have got 3 containers of durian in my fridge. Hopefully I can make some durian cake tomorrow since it is weekend. Are you happy with your job? Glad that you do but I am not. The company that I work for has taken over 4 other food and bakery outlets in just 3 months, hoping that the outlets will turn around and make money with the change of management with the same owners. Our workloads have since doubled. They have taken things for granted that it is perfectly ok with the additional workloads assigned to us without properly planning on the human resourcing and financing, with only 1 clerical added to the workforce , with a ratio of 1:1. We realise that they did not even put any consideration now that with all these added responsibilities, they still push us for deadlines and expect us to perform like before, don't they realise that the quality of work will drop when one is overloaded with work? The worst thing is the boss could just call in speak very harshly if she did not get what she wanted, the working environment has becoming so tense and with very low morale. Like a number of times which I came home with very disturbing and disappointing evening after harsh words that I received from the other side of the phone, I can not stand anymore but ease out my frustrations in words. They should be gladful that they are able to push over the workloads of 4 food and bakery outlets to us with no additional allowances given. I pray things will change to the better soon. We experienced a very strong wind yesterday evening in Kota Kinabalu, with a lesser strength as compared to the recent tropical storm Ketsana that hit the Philippines last weekend. The warning of the Typhoon Parma only reached us this afternoon via sms. Without any knowledge of the Typhoon Parma has already over, I reminded Clet to come home early just before he went off for his appointment. He came back at 9pm and told me that the visit of Typhoon Parma was yesterday, after checking on the internet, sure enough it's over and gone. Thank GOD, it did not do much harm to the people of Philippines and the countries nearby. Let's pray for better weather ahead.